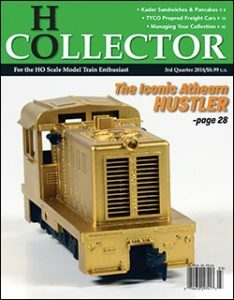 In the early 1970s, Cox introduced Athearn’s HO-scale Hustler to a wide audience of train set buyers. Athearn tooling populated Cox’s line until the introduction of Hong Kong-made models in 1975. Cox commissioned some amazing hobby artwork to help promote and sell its line of HO trains. If you received a Cox train set with a Hustler diesel, this was the artwork adorning the box lid in the early 1970s. The artist did some added detail work for The Hustler and provided handrails and pilot details not included on the model. Let’s go back in time to 1957. Irv Athearn had just released a HI-F powered F7 and a brand-new HI-F powered GP9, which was actually a GP7 with dynamic brakes. The “HI-F” was a direct belt drive mechanism, using a rubber band to drive each axle. The 1957 catalog stated “Athearn introduces the revolutionary EMD F7 diesel with HI-F drive for less than half the price of our competitor’s product.” But, if a modeler wanted a small four-wheel, gas or diesel industrial switcher, the only one available was Penn Line’s Whitcomb, called the “Midget Diesel,” priced at $9.95. It was die-cast metal and was pretty close to true size for the real Whitcomb switcher. Advertised in the 1957 Athearn catalog, came another four-wheel industrial switcher, called “The Hustler.” The HI-F drive enabled the locomotive to “pull up to 16 of our cars easily.” The catalog stated that it was a “Porter Yard Switcher.” Well, not exactly a Porter! The similarity really ends after you see that it has four wheels and an outside frame. I do believe that the $4.95 price and the flashy, striped paint schemes drew modelers to The Hustler. I got mine when I was in my early teens. I loved that little engine. Size-wise, it would be a 35-ton switcher, of about 1950s build. Here’s another early sample of Athearn promotional literature with the model taking its official name, “The Hustler.” The company boasted this modest-sized diesel switcher model was capable of lugging around up to 16 Athearn-made HO-scale freight car models. Releases provided solid color body shells with eye-catching striping on the pilots, nose, cab, and frame. Being available in several color schemes, with numbers painted on the sides of the cab, compared to the plain Penn Line Whitcomb that had an immature “PENN LINE” on the cab, was a huge draw. Later Penn Line Whitcomb switchers had company names printed on the cab sides. 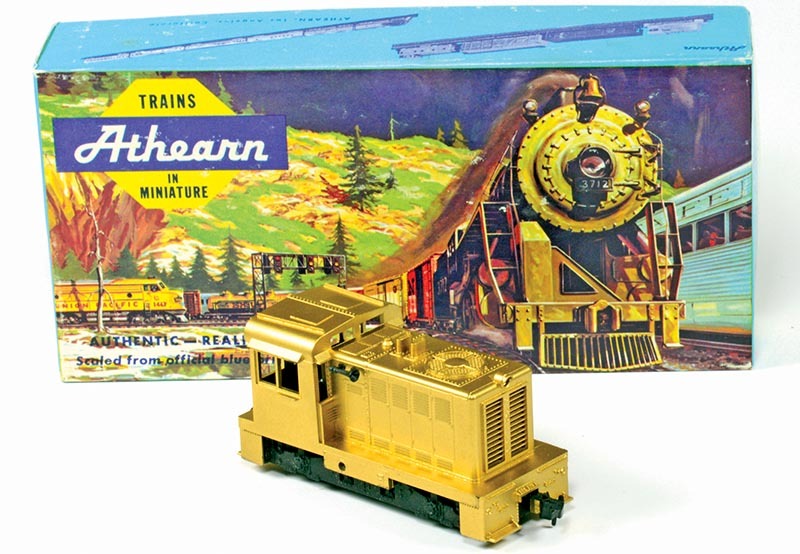 Athearn’s HO-scale Hustler was so attractive. Also, with multiple numbers available for each color, a person could have a fleet of these locomotives. The downside was that the HI-F drive gave the little engine great speed – perhaps a top speed of 300 miles per hour. As a kid, I wanted to mount two pulleys on the motor drive shaft, which would make the little locomotive go even faster. Never did it, though. The Hustler was a smooth runner and very quiet, compared to the gear drives available at the time. This blue Hustler appeared in Lionel-HO’s line in 1958 and 1959. 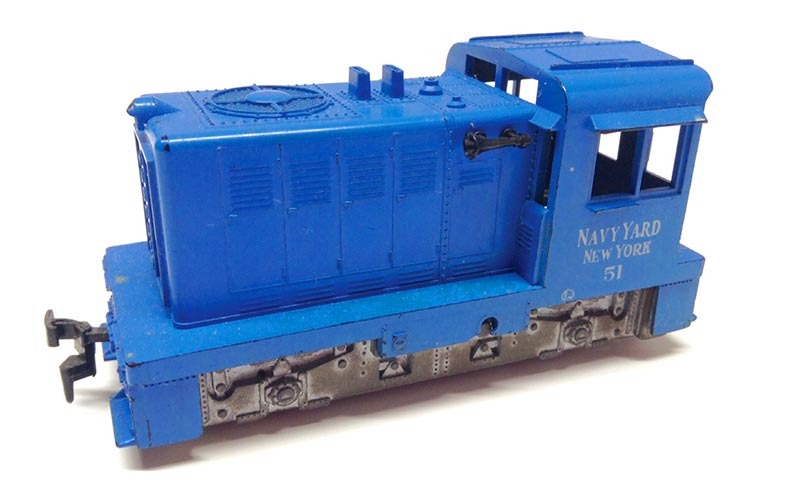 Produced by Athearn, the model came lettered for Navy Yard and was Lionel’s No. 0570 release. An indicator of this being a Lionel-HO release is the circle-L emblem on the lower cab side. 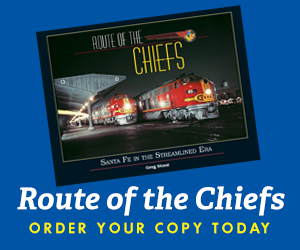 The Lionel-HO collection also included a black with orange cab side Rio Grande offering (No. 0560) that came with the snowplow attachment. The Hustler body was molded plastic, with nice door and louver details. This was the second of the wide-hood locomotives, so that the Athearn motor fit inside the shell. An EMD-style fan appeared on the top of the hood. There was nice, open radiator screen detail on the front of the hood. Twin EMD-style stacks protruded from the top of the hood. That must have been some prime mover under that modest hood to need dual stacks – not the normal Buda gas or Cummins diesel that was under the hood of the Whitcomb, Davenport, Plymouth, or Porter switcher prototypes. There is also something that resembles a steam generator stack on the roof. The hood doors, while nice, were similar to GP9 hood doors and not like other small switcher doors. Basically, it is not a prototype of anything, but it is a neat-looking, little locomotive that “might have been.” It is a generic, representative example of modern industrial switchers. However, I pity the poor engineer. There are no steps or ladder for him to climb up onto the engine. The corners of the locomotive should have cutouts that form the steps to climb on. But there are also no grab irons to hang on to while one climbs. And there are no handrails on the ends or the sides to prevent a person from falling off. A molded-on handrail on the hood sides would have served the purpose of the side rails, like on a Baldwin or Fairbanks-Morse switch engine; that is what appeared on the full-sized Whitcomb and was on the Penn Line model. People have added side and end handrails, but the lack of steps remains a problem. From 1962 to 1964, Hustlers were assembled for Athearn, under contract by Cliff Line. I wonder how many other Athearn engines were assembled by others for Athearn? It would be obvious that the bodies were molded and painted at the Athearn factory. Read the rest of this story in the 2018-3 issue of HO Collector!